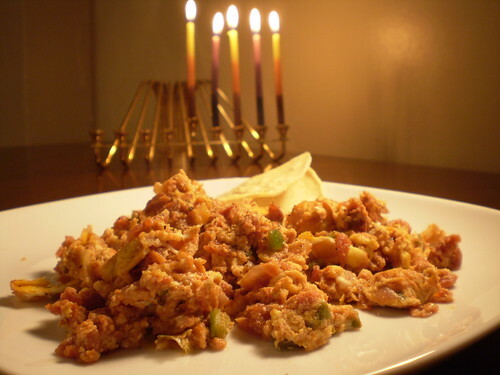 I did some Hanukkah food research today, and to my surprise there are two schools of thought. One belief is that holiday foods must be fried, while others merely require the food be cooked with olive oil. The holiday foods I grew up with were always fried, so I assumed that is what they needed to be. But after consulting with the all-knowing, all-seeing internets, I realized that there are sources out there that do not feel the frying aspect is necessary. Despite fried food's deliciousness, I decided that I don't need to celebrate this particular miracle from thousands of years ago with trying to create my own miracle (namely not gaining a pants size or clogged arteries from eating fried food for 8 days). I'm going with the more sensible, "cooked with olive oil" tradition. With that cleared up, I proceeded with a quick light supper (borrowed from my brunch repertoire) of Huevos a la Mexicana. 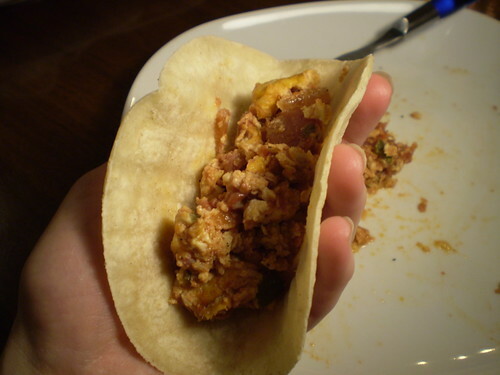 It is basically eggs scrambled with the colors of the Mexican flag, green (chiles), white (onions), and red (tomatoes). It is another one of these modest dishes where a few very ordinary ingredients combine to make a fine meal. I always serve these egss with small corn tortillas for a more authentic flavor then the supermarket flour type. Cook the onions in miraculous wonderful olive oil until translucent, then add the chiles (leave the ribs on for a spicier version), and the tomatoes. Cook for about 5 minutes until some of the juice from the tomatoes renderss out a bit, and the chile is no longer raw. Then pour in some beaten eggs and mix it altogether. Cover and let the eggs set. That's it, nothing fancy. Although this is not holiday fare to serve your relatives, it is technically within keeping with the tradition. It will allow you to bravely plough through one of the eight days without feeling remorse for subsisting on fried food and holiday cookies for the next week (or two). Viva la revolución! Heat the oil in a skillet. Add the onion and saute until transparent. Add the chiles, tomato, and salt and cook over medium heat for about 5 minutes. Add the beaten eggs to the pan and stir to incorporate. Cover and cook for 2-3 minutes or until eggs are set. Break up with a wooden spoon once done. Serve with warm corn tortillas.